Online poker players in all three US states where the pastime is formally authorized and regulated will soon be able to compete against each other, according to a player-sharing compact between New Jersey and the other two states that was announced on Friday by NJ Governor Chris Christie. The sharing of player pools between the three states is a vital long-term move for the viability of regulated online poker in the US, which has stagnated since being introduced four years ago. The problem has been the lack of liquidity, due to the relatively small numbers of online players in the three US states, a problem which parallels the experience of fire-walled European countries France, Spain, Italy, and Portugal. 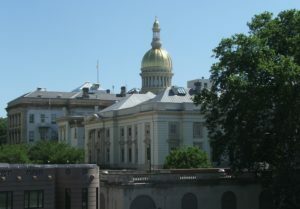 Trenton, NJ – Governor Chris Christie announced today that he has reached an agreement with Nevada Governor Brian Sandoval and Delaware Governor John Carney to allow Internet gaming patrons in New Jersey to play online against players in those two states. New Jersey’s entry into this multistate agreement will increase jackpots and opportunities for play, while also providing an incentive for operators to expand Internet gaming offerings upon locating their gaming servers in the State of New Jersey. Operators will be able to allow their customers to participate in games such as poker, tournaments, and progressive slot games with players in other states where they are licensed. Regulators in each of the three states will have to approve an operator interested in offering games to persons in each state and approve the game software that will be used. “New Jersey stands prepared to approve a game offering for all three states as soon as an operator submits such a product for testing,” said David Rebuck, Director of the New Jersey Division of Gaming Enforcement. Since New Jersey authorized online gaming in November 2013, annual revenues have steadily increased. In 2016, the Internet gaming win was $196.7 million, which helped propel Atlantic City to its first year-over-year increase in gaming revenue in almost a decade. Internet gaming revenue is projected to increase further to $240 million in 2017. New Jersey currently has 23 authorized Internet gaming websites. A list of those websites and their Atlantic City casino partners can be found here: www.nj.gov/oag/ge/gamingsites.html. No specific date has been set for the official pooling of poker players from New Jersey with those from Nevada and Delaware, which already have an active pooling deal in place. It’s the addition of New Jersey to what will be a virtual three-state network that’s vital, however. New Jersey has roughly nine million residents, which is about double the combined populations of Delaware and Nevada. Las Vegas alone has a metropolitan-area population approaching three million, and it is an American (and global) hotspot for online-poker play, but this deal will at least double the number of potential participants in both online tournaments and cash games, with a liquidity effect even larger than that. New Jersey had been in casual talks with the other two states for at least the last two years, but had always been perceived as being cool to the deal. Two factors played into that. First, each of these states’ laws regarding online poker require the hardware and software platforms supporting the gaming activity to be physically present in each of the states; some operational redundancy will remain after New Jersey joins the mix. Second, some differences in gamin rules and tax-revenue allocations had to be ironed out, with that almost certainly being allocated based on each player’s location (point of consumption) as the games occur. The deal covers only online poker, which is of course the only form of player-versus-player (peer-to-peer) online gaming currently offered by any of the sites in the three states.